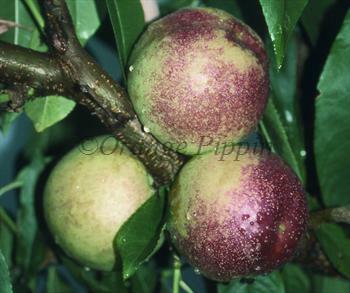 Lord Napier is an early and large nectarine, reasonably suitable for the sunnier parts of the UK. The skin has a very dark crimson cheek in full sun. Whilst most English nectarines tend to be yellow-fleshed, Lord Napier is a white-fleshed variety. It is also a "freestone" - in other words the flesh does not cling to the stone. Lord Napier is best grown on a south-facing wall if possible, or in a very sunny aspect. Please fill in the details below and we will let you know when Lord Napier nectarine trees are back in stock. Lord Napier is self-fertile and does not need a pollination partner, although fruiting may be improved if there is a compatible tree of a different variety nearby. Insofar as any nectarine is suited to the UK climate, this is it. It is self-fertile so no pollination partner is required, and ripens in early August. Like all nectarines and peaches Lord Napier is susceptible to peach-leaf curl. It is best to cover the tree in late winter and early spring with a horticultural fleece to keep rain splashes off it. Lord Napier was developed by the famous Rivers nursery at Sawbridgeworth, UK, 1860. It is thought to a smooth-skinned seedling of a peach called Early Albert.